The October 2015 Capricorn Horoscope predicts that work and personal achievement will be a priority this month. Family affairs will run smoothly and you may not place unnecessary emphasis on them. More than 70 percent of the planets will be changing over to the East by the 7th in your horoscope. Independence and strong will power will rule your life after the completion of the Mercury Retrograde. You are the master of your destiny and the course of your life will be decided by you. There is no need to seek the cooperation of others. You can also read more astrology predictions for 2015 to know more. 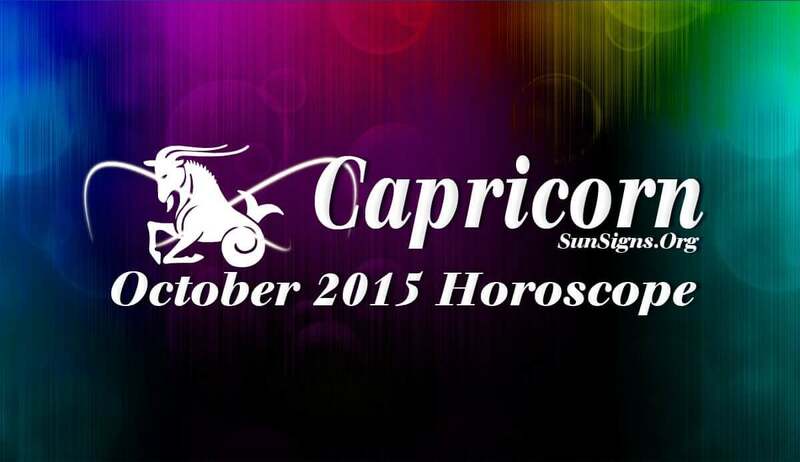 The Capricorn monthly astrology predictions for career in October 2015 forecasts that professionally, you will see wonderful growth with increase in emoluments, promotions and awards. Businessmen will be happy with the prosperity in their ventures. If you are seeking a new job, you have to exercise caution with the offers you get. Financial projects will move forward this month for the Capricorn zodiac sign. Your intuition with monetary dealings is excellent and this will result in profits from risky ventures. Money can be expected from unknown sources. You will be creative and find new methods to generate money. There is overwhelming support for your financial projects. The October 2015 Capricorn horoscope also predicts that family relationships are affected by your focus on career. Present relationships will see turbulence. Singles will find love through online dating. First and last weeks are auspicious for getting into romantic relationships. Pregnancy is better postponed to the next month. Health will be better for the Capricorn after the third week of the month. So go slow and take enough rest till that time. If you are feeling extra tired or fatigued, take a break and go for a weekend holistic getaway.